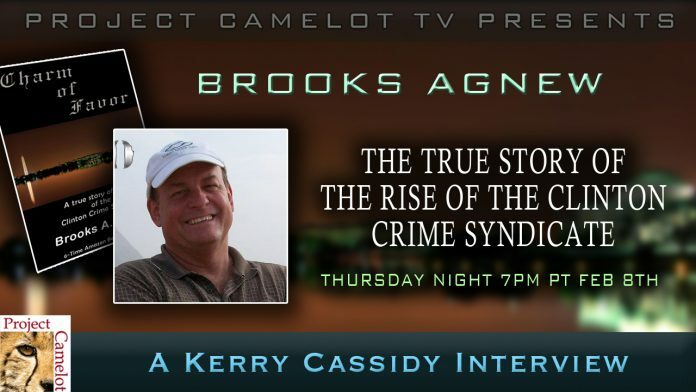 BROOKS AGNEW is my guest THURSDAY NIGHT FEB 8TH @ 7PM PT. We will discuss his new book : CHARM OF FAVOR : THE TRUE STORY OF THE RISE OF THE CLINTON CRIME SYNDICATE. Brooks A. Agnew was born and raised in southern California and joined the Air Force in 1973. He graduated 2nd in his class in Electronics Engineering. Beginning his university studies at University of North Dakota, he continued to Brigham Young University, then to Western Kentucky University, and finally to Tennessee Technological University where he graduated with honors in Chemistry. He was also graduated first in his class for Entrepreneurial Studies at the Tennessee Tech School of Business. His professional career includes more than 25 years in the manufacturing industry as a platform launch engineer and quality engineer. He was a consultant to Tier I and Tier II suppliers to Toyota, GM, Chrysler, and Nissan. In addition, he holds numerous patents in the design and manufacturing of electric vehicles, polymer chemistry, and financial instruments for securitization. He is a Six Sigma Master Black Belt with more than $500 million in completed projects and continues to consult with many of the world’s largest corporations. He holds numerous patents, trade secrets, and proprietary knowledge in numerous industries including Chemistry, sub-space communications, electric vehicle technology, and architecture. He is a 7-time best selling author, internationally acclaimed public speaker, and has been the host of X-Squared Radio for 14 years. He currently resides in Charlotte, North Carolina and travels the world teaching, consulting, and lecturing. Phoenix Science Foundation has worked tirelessly for 7 years to create clean and renewable energy awareness and to help numerous technologies to reach commercialization from the prototype stage of their inventors. In 2008, as President of the company, he successfully designed and launched the alternative fuel industry’s first continuous manufacturing system for Biodiesel from oilseeds. He continued the process by designing a algae-biodiesel production facility for the Department of Energy. EV Fleet, Inc. designs and manufactures affordable electric vehicles for the American highway. As president & CEO of EVFI, he designed the CONDOR light electric pickup truck that is the first in its class of light trucks. Through his leadership and technological designs, he was able to attract the world’s most profitable car maker as a partner to bring this vehicle to the global marketplace.